Tile Shower & Shower Pan Refinishing – Are you interested in an alternative to replacing the tile in your shower and shower pan? Are you considering replacing your shower because tile grout repair is necessary or because the tile in the shower looks bad? Tile showers usually consist of three walls of tile and a shower door placed on top of a shower pan with a drain. Just because the grout is loose, the tiles chipped, or the tile is out-of-date doesn’t mean that the tile shower and shower pan need to be replaced. Miracle Method can repair any cracks or chips, float in new grout, and refinish the tile in your choice of colors, or even in our new Natural Accents stone finish. The Natural Accents™ stone finish will give your tile shower walls and shower pan the look of expensive granite or marble at a fraction of the cost of real stone. 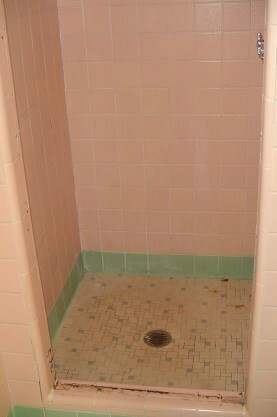 You’ll be able to use the shower in 24 to 36 hours after the refinishing process is completed. 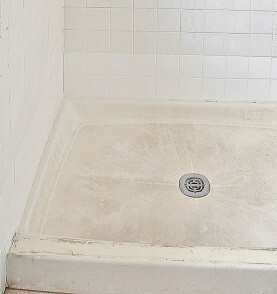 The end result will be a tile shower and shower pan that will look and feel like new again. 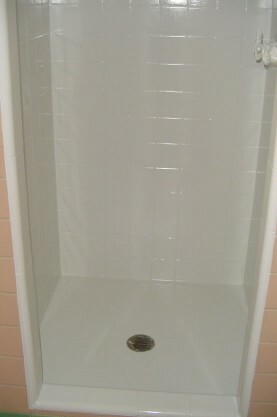 Tile shower refinished to a glossy white! Only when the tile backing is wet or loose is refinishing possibly not an option. If the backing wall is not stable or badly deteriorated, the tile may have to be removed and the backing and tile replaced before the refinishing process can be completed. Tile Shower & Shower Pan Refinishing – What is the refinishing process? 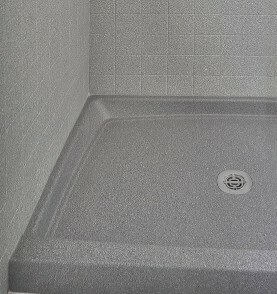 Refinishing a tile shower and shower pan is similar to bathtub refinishing in which a two-step cleaning process is used to remove soap scum, body oil and dirt in order to remove contaminants before the new coating is applied. Following cleaning, the grout is floated. This is a procedure in which a squeegee is used to spread a small amount of grout over the surface to fill and even out tile grout lines. Once done, the tile is cleaned and Miracle Method’s MM-4 bonding agent is applied to ensure adhesion with the new coating. Once refinished with hi-tech acrylic coatings, the end result is a bright, glossy finish with clean and even grout lines. The tile wall grout is completely sealed, eliminating any need to regularly reseal the grout lines. Click on Find a Location or call our toll free locator number, 1-888-271-7690, to reach the nearest Miracle Method professional and ask for a free estimate to refinish your tile shower & shower pan.